Horizon Fast Ferry connect Harbourfront Centre terminal in Singapore with the Harbour Bay ferry terminal on Batam Island, Indonesia. Horizon Fast Ferry was previously known as Prima Ferries, changing their name following the arrival of new, fast, comfortable ferries. Horizon offer numerous crossings daily, generally running between eight in the morning and half past nine in the evening. With their slogan, ‘Horizon, your comfort choice’, instead of just trying to compete on price, Horizon differentiate itself from the other ferry operators in the region through innovative, efficient and economical design of its Flex Ferries and focus heavily on the comfort of their passengers. The Horizon ferries have a capacity for up to 240 passengers, including a main seating deck for standard class up to 208, an upper business class deck for 30 passengers as well as a VIP room that can house 4 passengers. Passengers in standard class will find spacious ergonomic seating with ample legroom and ergonomics seats, and of course a friendly service on board. The business class passenger are on the upper deck ensures a comfortable and quiet trip, even when the ferry is at full speed while the VIP room promises more space and privacy. Passengers travelling in business class or in the VIP room will also get priority boarding and disembarkation included in the ticket. View Horizon Fast Ferry timetables, prices and book Horizon Fast Ferry ferry tickets with directferries.com. Looking for an alternative route or ferry company to fit your plans? 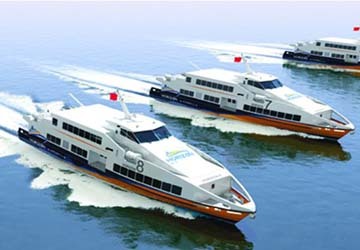 Don’t worry, we’ll also compare Horizon Fast Ferry with alternative ferry companies in your search to help you choose.